Kyle Busch doesn’t need an introduction. He came out with a bang at Bristol Motor Speedway. Bristol Motor Speedway installed trackbite on the inside groove of the high banked conrete oval. That application is designed to provided added grip to grooves of the track that aren’t generally preferred. However, it’s also activated by heat. 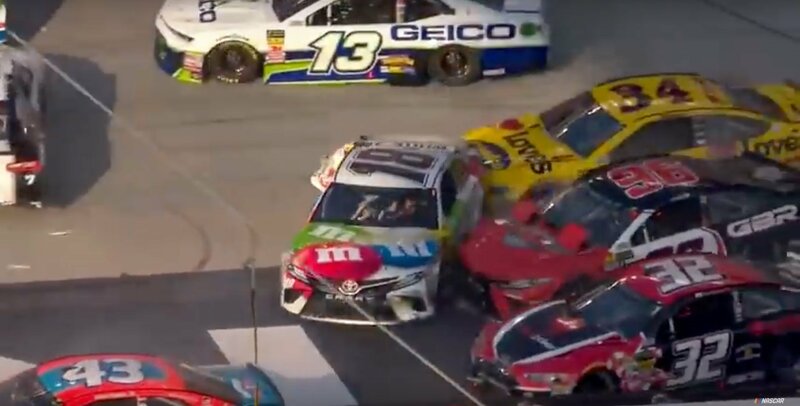 Lap 2, Kyle Busch lost traction while running in the trackbite. He slid up the track and clipped the left rear of Ryan Blaney. Kyle Busch went around in front of the field in turn 4. Truex, Suarez, Gaulding, Micdowell all made direct contact with the #18. “Everybody hit Kyle. The dude that started last hit Kyle,” Brett Griffen, spotter for Clint Bowyer stated after the wreck. Despite contact from 4 cars, the #18 was still rolling. All four fenders were dented, the door was caved in, the deck lid was twisted and the rear bumper cover was knocked completely off. On lap 2, the precision built race car was now correctly shaped for door banging event in Bristol, Tennessee. “All the rear sheet metal’s KO’d,” Tony Hirschman radioed to the #18 box. “It definitely looks salvageable. Um, we’ll cut that bumper cover off,” Adam Stevens, crew chief for the #18 responded. “I could see his car was pretty destroyed. I was surprised NASCAR let him race without a bumper cover like that,” Kyle Larson said after his runner-up finish at Bristol Motor Speedway. “But, he was able to drive through the pack and put on a pretty good show for the fans. He put on a good show I’m sure,” Larson concluded. Damage repairs relegated Kyle Busch two full laps down to the leader. And at one point he was 10 feet from going a 3rd lap down. However, Kyle Busch made both laps back and drove to the 3rd position. A late race crash with Martin Truex Jr was followed by 3 wide, door banging racing. Kyle Busch ended up cutting a tire following the contact. He went on to finish in the 20th position but he certainly put on a show. NASCAR is here to set the record straight. Steve O’Donnell has explained the rules regarding the rear bumper cover. Honestly, it’s a rule I didn’t understand either. So, most of us will probably learn something new here. “There is no bumper cover issue really. It’s clearly spelled out in the rulebook which tracks you have to have which parts, NASCAR Senior Vice President of Competition Steve O’Donnell stated via ‘The Morning Drive’ on Sirius XM NASCAR Radio.